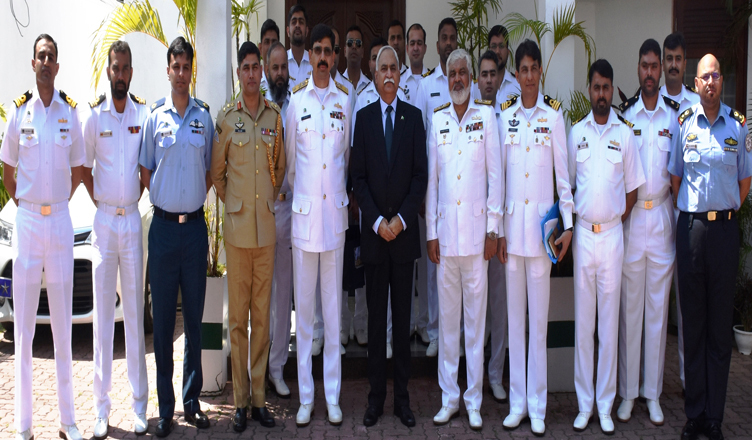 (COLOMBO, LANKAPUVATH) –A 21-member delegation of Pakistan Navy War College, led by Rear Admiral Naveed Ahmed Rizvi, Commandant of the College, visited the High Commission of Pakistan on April 08, 2019. 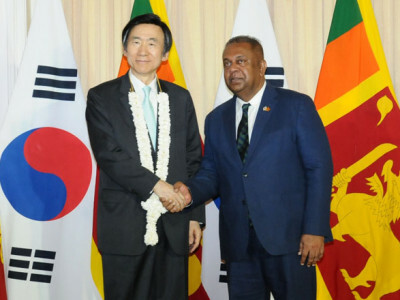 The delegation is currently in Sri Lanka on 5-day foreign study tour from April 07 to 11, 2019 on the invitation of Sri Lankan Navy. High Commissioner of Pakistan, Major General (R) Dr. Shahid Ahmad Hashmat, during his meeting with head of the delegation expressed the deep satisfaction on Pakistan Navy’s pivotal role in strengthening the bonds of friendship between the two nations through training of officers & sailors and Humanitarian Assistance, Disaster Relief and mutual support operations. During the interactive session, the Defence Advisor of Pakistan, Col. Sajjad Ali gave a comprehensive presentation on Sri Lanka-Pakistan relations. The delegates, during their stay in Sri Lanka, will also call on Chief of Defense Staff, Commanders of Sri Lankan Army, Air Force and Navy.